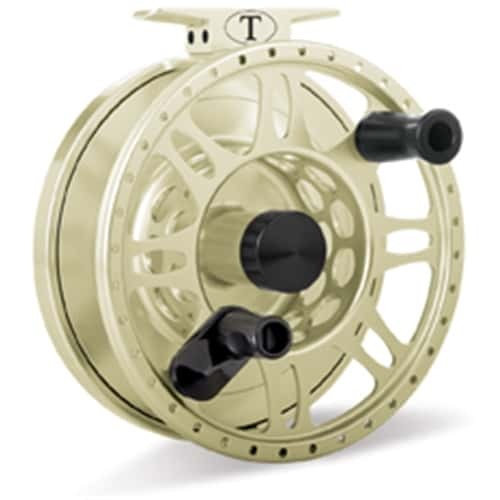 Tibor Everglades Fly Reel series of reels were first introduced in 1995 an have established themselves as the benchmark for custom-crafted fly reels. The Tibor Everglades Fly Reel was development after years of input from the likes of Lefty Kreh and Flip Pallot, Ted was finally satisfied with the Everglades fly reel that truly has set a new standard in fly fishing reel technology. The spool's large arbor design significantly enhances the rate of line retrieval which is critical when you're trying to control speedsters like bonefish, bonito, or wahoo. Tibor Reels are also a mainstay for Spey enthusiasts, delivering the ultimate balance, overall capacity and drag performance for the double handed rod. As with the Everglades, Riptide, Gulftstream and Pacific fly reels, the drag system is absolutely flawless and has withstood the test of the world's most demanding game fish, including 234 World Records, so far. If you were to own only one fly reel, this is the one to have. The spool has been updated for 2016 and will fit into older reels. • All internal parts are sealed from the outside elements. • Large outer hub offers quick retrieve. • Impregnated cork disc drag system delivers the strongest, smoothest and most reliable performance on the water. SpeedHandle Spool option also available. Made from solid aluminum bar stock. Standard finishes are Jet Black and Satin Gold. Other finishes are available. Triple outgoing line signals, easily removable for silent operation. Free engraving on name plate. Each reel is serialized for identification and protection. Even large arbor fly reels have trouble keeping up with hard-charging species like Tuna, Tarpon and Bonefish. After a deep dive or a long run, they’ll turn and come racing back towards you. Suddenly, you can’t take up line fast enough; you can’t stay tight to the fish. And when the tension goes, so goes your chance of landing that trophy. That’s why Tibor is pleased to offer another simple, yet ingenious innovation to help fisherman catch more fish – the Tibor SpeedHandle Spool. Available as an option on Tibor and Tibor Signature Series reels and spools. The SpeedHandle Spool increases the speed of your retrieve up to one-third, so you’re less likely to have the hook drop out of the fish’s mouth or encounter the problems inherent in a slack line. Land more of the fish you hook with the Tibor SpeedHandle Spool – another innovation on the fly from Tibor Reel Corporation. Retrieves line up to one-third faster. Adds no weight to your reel. Features a simple, foolproof design with a limited lifetime warranty. Available as an option on new Tibor and Tibor Signature Series reels and spools. Frame Size: 3 3/4" x 1 3/8"
Spey Rod Weights: 5-6: Capacities vary by spey line type & selected backing orientation. Add a personal touch to your new Tibor, Tibor QCTM and Tibor Light® reels! In addition to our custom colors, you can take your expression of your passion for fly fishing a step further with our exclusive engraved game fish images. Also a great way to personalize the gift of any new reel. Free personalized name plate engraving! For those fortunate enough to have accomplished, a special Grand Slam edition is available. And this year, we introduce two new species to our popular game fish engraving series. By special order - New reels only (Tibor QC, Tibor and Tibor Lidght CL) you can have one of the following: Albacore-Bonefish-Dorado-Marlin-Permit-Pike-Redfish-Roosterfish-Sailfish-Salmon-Snook-Striped Bass-Tarpon-Trout Gamefish and custom engraving is available by special order on new reels only. This Tibor Everglades Fly Reel is a real masterpiece, so thanks a bunch Platte River Fly Shop and the customer service was also excellent as all of my questions were answered quickly and thoroughly.